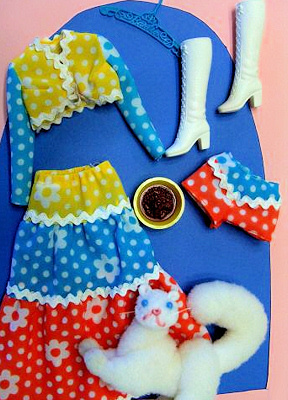 Barbie's white kitty cat has blue bead eyes, a pink stitched nose and mouth and a yellow food bowl. Her outfit is made of yellow, blue and orange tricot with a white polka dot and floral pattern. The top, skirt and shorts have white rick-rack trim. The skirt has three tiers and the top has long sleeves. This is one of three ensembles from a group called Put-ons 'n Pets. 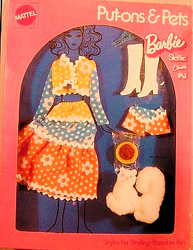 They include an ensemble and a pet for Barbie. They are all hard to find. The other two are Hot Togs and Poodle Doodles.